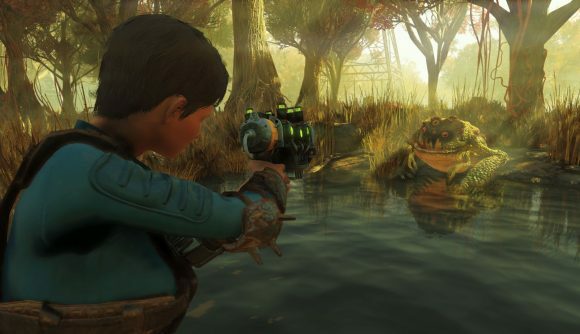 Fallout 76’s latest update adds a new survival mode. It’s listed as a beta for now, but there aren’t any apparent restrictions on your ability to get in or what you can do once you’re there. Survival is all about PvP, and there won’t be any restrictions on who can attack who. In the standard mode – now rebranded as adventure – the threat of PvP has been greatly reduced. You can select survival from the main menu, which will drop you into a harsher mode that doesn’t put any limitations on PvP, leaving you free to attack other players. You’ll drop a random number of aid items (on top of your junk) when you die, and you’ll have the option to spend some caps and put a bounty on your killer’s head. You’ll get twice as many caps for dweller kills, and you’ll also get a 20% XP bonus for everything in survival. Survival will also bring a new set of weekly challenges with a new set of legendary weapons to unlock. The official site has details on the weapons you can get during the first few weeks. Everything carries over between adventure and survival, so you’ll be able to bring your kitted-out character directly over to the harsher mode. That means you’ve got a jumpstart on getting competitive in the PvP-focused world, but it also means players aren’t necessarily competing on an even playing field. Alongside the launch of survival, the standard mode is dropping ‘slap damage’ – the little bit of damage you incur when a non-hostile player shoots at you. You’ll still become hostile if you return fire on another player or attempt to claim their workshop, but you’ll be at a greatly reduced risk of getting into unwanted PvP. Bethesda detailed the Fallout 76 roadmap just over a month ago, and the first set of updates are collectively known as Wild Appalachia – which this survival addition falls under. Later in the year, we’ll see Nuclear Winter and Wastelanders, which will respectively bring a substantial new game mode and the “biggest and most ambitious update for 76” yet.